Syrian President Bashar Al-Assad, responding to weeks of intense pressure, announced, on Saturday, that Syria would move its troops to the Lebanese-Syrian border in a two-step pull-back that he said should satisfy international demands for a complete withdrawal. "Syrian troops will completely pull back to Bekaa valley in eastern Lebanon and then to the Syrian-Lebanese border," Al-Assad announced in his speech, addressing the parliament in Damascus. His careful speech was constantly interrupted by zealous applauds from law-makers in the chamber and thousands of Syrian supporters listening outside the building, chanting national anthem and waving national flags. "By carrying out this measure, Syria will have fulfilled requirements of the Taif agreement and implemented the UN Resolution 1559," said the Syrian president. Al-Assad said he would meet this week with Lebanese President Emile Lahoud to discuss the withdrawal plans. Syria and Lebanon have kept a close relationship for the past three decades since Syrian troops entered Lebanon in 1976 to intervene its 1975-90 civil war. Syria still maintains 14,000 troops in Lebanon after several redeployment in recent years. But this special relation has been challenged since UN Security Council resolution 1559 was adopted last September at the initiative of the United States and France, demanding a pullout of foreign troops from Lebanon. Al-Assad faced a week of intensive world and Arab pressure on Syria, beginning with the resignation of Lebanon's pro-Syria government and ending with Saudi Crown Prince Abdullah telling him face-to-face to get all his forces out of Lebanon quickly. The US State Department said Syrian President Bashar al-Assad's announcement today of a gradual withdrawal of 14,000 troops from Lebanon, is not enough. In Beirut, around 1,000 Lebanese watching the speech on large screens in the central Martyrs' Square seemed unconvinced by Al-Assad's words. 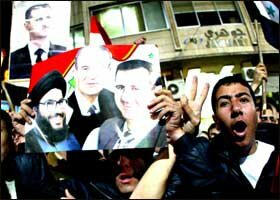 Waving Lebanese flags, they continued the chants they have shouted in weeks of demonstrations: "Syria out!" and other anti-Syrian slogans. Walid Jumblatt, the leader of the Lebanese parliamentary opposition, said- in interview with Al Jazeera from Riyadh, that Al-Assad's speech has 'some positive points' and the Lebanese will need to see how implementation will take place. "The troop withdrawal isn't enough," other Lebanese opposition politicians said. "Syrian intelligence officers in Lebanon also should leave," voiced others. Israel's foreign minister Silvan Shalom dismissed Syrian President Basher Al-Assad's speech announcing only a partial withdrawal of Syrian troops from Lebanon. "Israel demands a full implementation of UN Resolution 1559, meaning a complete withdrawal" said Shalom at a news conference with Jordanian Foreign Minister Hani al-Mulqi. "A Lebanon free of Syrian influence could lead to a long-sought peace with Israel," added Shalom. The Jewish State, which withdrew its forces from southern Lebanon in 2000 after 18 years of occupation, believes only Syrian pressure stopped Lebanon from joining Egypt and Jordan in making peace with Israel.